At Hair-Do we are all about education. We honestly believe that the moment you stop moving forward, you start falling behind. In the salon industry things are always changing and evolving, so the only way to keep up is to keep learning. We are constantly attending outside education events and bringing them back into the salon. We hold in-salon education for our staff at least 1-2 times a month and have been asked many times over if we ever open up our education to outside stylists. So 2017 is the year we open up our education calendar. Following is the list of classes we have available, we would love for you to join us. If you have any questions feel free to call the Salon. Taught by Charlie Cutter, National Color Educator for 10 years & Suzanne Bell, Colorist/Educator for over 30 years. Most people have “comfort foods” we have “comfort color”. This pinwheel technique perfectly marries “Lived-in Color” and “Ombre/Balayage”. You’ll learn how to get beautiful even color results every time. Because we are new to the outside education circuit, we are pricing this first class at $350, normally it will be $450. Class is from 9:00 – 4:00, please bring a blow dryer, clips, stylist apron, rattail comb, a brush and proof of cosmetology license. Class is Hands-On, mannequin and lunch provided. 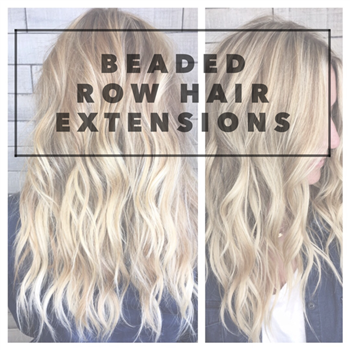 Beaded Row Hair Extensions – Beaded Rows have taken over the extension world. It’s no longer an option to know how to do them, but a necessity. We have been doing hair extensions at our salon for over 15 years and have seen installation techniques come and go, beaded rows are easily the most popular technique we’ve ever seen. Sara Haws and Suzanne Bell are the educators for this class. Sara has been a stylist for 16 years and extensions have become her passion. She has an infectious personality and everyone she meets wants to be her best friend. Suzanne has been doing extensions for over 15 years and has been able to incorporate the best techniques from all the different methods to create the beaded rows we teach in our salon. We keep our class size small when doing extensions because we want to have a good teacher to student ratio as this technique requires a lot of one on one. This class will normally run $500, but we are doing our first class at $350, a non refundable payment of $100 is required to hold your spot. Balance is due the day of the class, if you’d like to make multiple payments before the class please do so by calling the salon at (480)539-7050. If you have a favorite rat tail comb, you’ll want to bring it, otherwise a mannequin head and tools will be provided. This class is hands on and runs from 9:00 – 1:00. Refreshments will be provided. 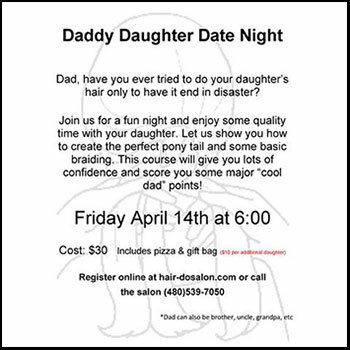 Daddy Daughter Date Night: Taught by Chelsea Hall. Daddy Daughter Date Night - Join us for a fun night and enjoy some quality time with your daughter. Let us show you how to create the perfect ponytail and some basic braiding. This course will give you lots of confidence and score you some major “cool dad” points! Starting time is 6:00 and cost is $30 for 1 daughter and $10 more for a 2nd daughter, class is taught by Chelsea Hall. A pizza dinner will be provided and you’ll go home with a fun goody bag. 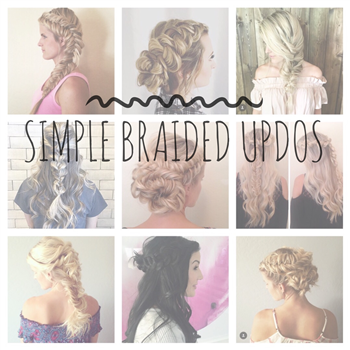 Simple Braided Updos: taught by Christin Roberts. Simple Braided Updos - A good braid is like a work of art, and hair stylists love to get their artistic juices flowing. Join us for an amazing hands on experience learning how to incorporate braids into your everyday services as well as taking your special occasion hair to new levels. This class is taught by Christin Roberts, who has been featured on Fox 10 news as well as in Luca Magazine. She is such an amazing teacher that you’ll have so much fun learning you’ll forget you’re being educated. Class is $75 and runs from 9:00-12:00. A non refundable deposit of $25 is due to hold your spot and the balance is due the day of the class. If you would like to make multiple payments please call the salon at (480)539-7050. 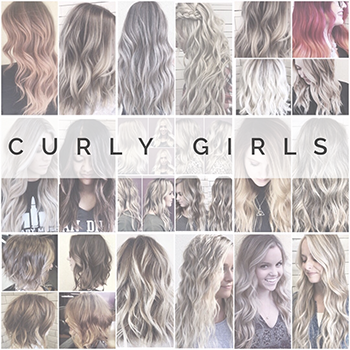 Curly Girl - Do you struggle to get those fun beachy curls? Do you wonder how the celebrities get their perfect coiffed waves? Do you want to have cute hair everyday? If you answered yes to any of these questions you’ll want to attend our Curly Girl Event. Starting time is 6:30, refreshments will be provided. Cost is $30 and you’ll go home with a fun goody bag. 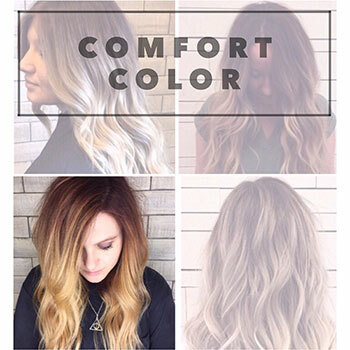 Comfort Color: taught by Charlie Cutter & Suzanne Bell. Comfort Color – Just as most people have “comfort foods” we have “comfort color”. This pinwheel technique perfectly marries “Lived-in Color”, “Ombre/Balayage” and “Color Melting”. 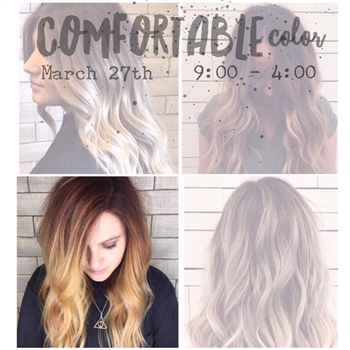 You’ll learn how to get beautiful consistent color results every time. This technique is taught by Charlie Cutter and Suzanne Bell. Charlie has been a National Color Educator for Paul Mitchell for the last 5 years and is a color genius. If she could spend all her working days doing color corrections she would be a happy camper. Suzanne has been teaching color for most of her 30+ year career. 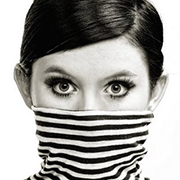 She heads most of the in-salon education as well as oversees all new stylist training. She is a magnificent teacher. Class is from 9:00 – 2:00, please bring a blow dryer, clips, stylist apron, a brush and proof of cosmetology license. Class is Hands-On, mannequin and lunch provided. Class cost is $400, a non refundable payment of $100 is required to hold your spot. Balance is due the day of the class, if you’d like to make multiple payments before the class please do so by calling the salon at (480)539-7050. Hair-Do Salon is an independently owned and operated hair salon located in Mesa, Arizona. We are committed to working as a team to provide the highest quality service possible to our clients. Our goal is to exceed your expectations.